Clothing/Jewelry Description A gray hooded sweatshirt, black skinny jeans, silver rings on her right ring and middle fingers, and no shoes. 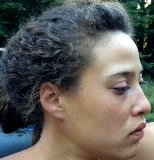 Medical Conditions Kreimer was suffering from a mental health crisis at the time of her disappearance; she was incoherent, paranoid and could not sleep. Her mother believes she may have bipolar disorder. Distinguishing Characteristics African-American female. Brown hair, brown eyes. Kreimer has a noticeable gap between her two front teeth, and a birthmark under her left breast. She has a tattoo of the red outline of a triangle on her right wrist; a photo of the tattoo is posted with this case summary. Kreimer speaks English with a pronounced Australian accent. Kreimer was last seen in Port Arena, California on September 21, 2015. At the time of her disappearance, she was suffering an apparent mental health crisis. She had no prior history of mental illness, but after staying awake for four days straight and shouting incoherently, she was taken to the hospital for an evaluation and possible admission. She resisted attempts to evaluate her, however, and in the end she was released to the care of her boyfriend and a friend without being assessed and without even having her vital signs taken. Kreimer stayed up another night, and the next morning she, her boyfriend and her friend decided to go to San Francisco, California to visit her boyfriend's mother. They stopped at the Rollerville Cafe near Point Arena. Kreimer was still acting strangely and refused to eat anything. At some point she got up to use the bathroom and never returned. She has never been heard from again. Her jacket was discovered on the trail the leads along the cliffs to the Point Arena Lighthouse, leaving to speculation that she might have jumped, but extensive searches turned up no sign of her or her body. However, her friend said Kreimer didn't have a jacket with her at the cafe. Kreimer is originally from Australia and has dual Australian/U.S. citizenship. She had been living in the United States for three years by the time of her disappearance. She didn't have her purse, wallet, cellular phone, identification, credit cards or even her shoes when she disappeared, and is considered to be at risk. Her case remains unsolved. Updated 2 times since October 12, 2004. Last updated September 5, 2018; distinguishing characteristics and clothing/jewelry description updated.